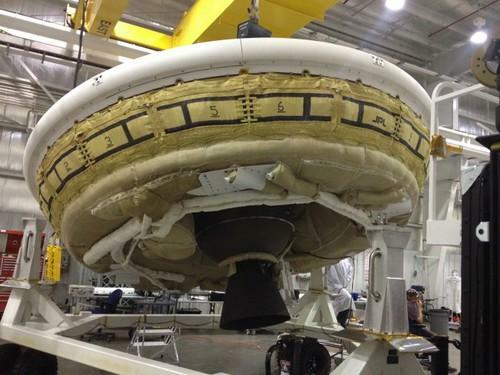 Typically the stuff of mystery, a real flying saucer could appear over the Hawaiian island of Kauai later this week, but it won't be coming from outer space. The rocket-powered, saucer-like craft is part of a NASA project that could aid missions to other planets. The craft, called the Low-Density Supersonic Decelerator (LDSD), looks something like a cross between a flying saucer and a large doughnut. The flight test will be the first time engineers get to test it out in conditions that are similar to those in which it is designed to operate. It will be carried by a high-altitude helium balloon to about 120,000 feet, which is more than three times as high as commercial airliners fly. Once there, it will be dropped from the balloon, and if all goes according to plan, four rocket motors will fire and gyroscopically stabilize the saucer. Then, a rocket engine will send it even higher, to the edge of the stratosphere. Engineers expect it to hit Mach 4 (four times the speed of sound) when it gets to 180,000 feet, at which point newly developed atmospheric braking systems should deploy. "Our goal is to get to an altitude and velocity which simulates the kind of environment one of our vehicles would encounter when it would fly in the Martian atmosphere," NASA engineer Ian Clark said in a statement. Engineers envision using the LDSD's experimental deceleration technologies on future spacecraft that will travel to Mars and other planets. The craft need a way to rapidly decelerate after entering the atmosphere and before hitting the surface. The flight will take place between 8:15 a.m. and 9:30 a.m. local time (18:15 to 19:30 GMT) on a day between June 28 and July 1, or on July 3, the space agency said Tuesday. It will be televised on NASA TV and carried on Ustream.